Here's How To Lose Weight And Become Healthy All While Enjoying The Most Delicious Dishes You've Ever Tasted! "Why Doesn't Anything​ Work Long Term & Keep The Weight Off?!" And after reading hundreds of articles, textbooks, and spending countless hours researching I've discovered one of the best ways for anyone to begin shredding weight off, while still enjoying tasty food and not having to become slave to a gym. And if you've ever been there you probably saw that nearly everyone over there is thin, healthy, and beautiful. It's the food that they eat, and the way they cook their food! I've taken everything I've discovered about the Mediterranean Diet and lifestyle and I've created the Fat Crushers' Mediterranean Diet Plan. It's a guide to losing weight and staying healthy all while enjoying some of the most scrumptious foods ever. You've got to prove to yourself that your own personal miracle is possible, even while enjoying the best tasting foods on earth. And the best way is to put the Fat Crushers' Mediterranean Diet Plan to the test! After your order you'll be taken to a download page where you can access the guide right here, right now on your computer! You don't have to wait days for anything to ship out, and you can get started even if its 2 AM in the morning. $27 is a drop in the bucket compared to the amount of money you're going to save by no longer having to fall victim to weight loss sham diets and scam products. 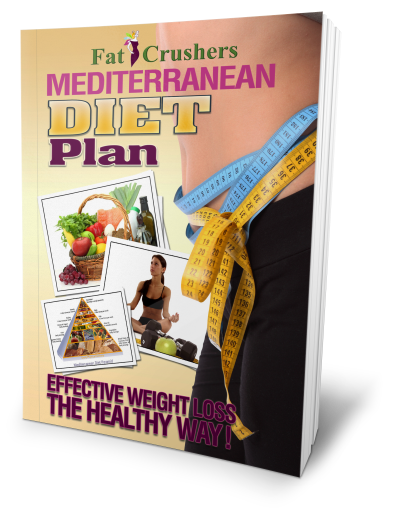 Order the Fat Crushers' Mediterranean Diet Plan right now and devour the ideas and information inside of it. Start applying what you learn from the book, and if at any time during the next 30 days you aren't satisfied with the results you're getting as a direct result of applying the weight loss and diet strategies, I insist you contact me immediately, and I will refund every dime of your money, quietly and promptly, no questions asked. Now its your turn for your very own personal miracle to begin with the Fat Crushers' Mediterranean Diet Plan. So please do yourself a favor and get this guide today, you won't regret it!